This St Patrick’s Day worksheet has two things kids can count. 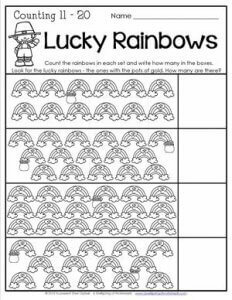 First, kids count the rainbows in each set and write how many in the space provided. Then they look for the Lucky Rainbows – the rainbows with a pot of gold at one end (hint: there are 6 of them). There’s no particular place to write this number though so kids can share how many they count with their neighbors.